I’m steadfastly knitting away on Glacier in my free moments, so I don’t have a lot to show you this week, other than that progress. 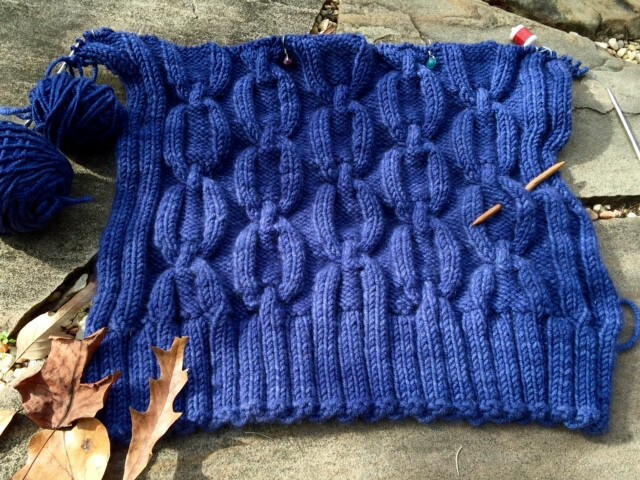 1-The Plucky Knitter’s Snug Bulky is one of my all time favorite yarns. It’s like knitting with butter, but the stitch definition, which matters a lot with the cables, is immaculate. 2-Cabling without a needle. If you haven’t started yet you should. It’s incredible how much more quickly the front is going than the back! I’m still using the cable needle for the nine-stitch cable, because the reserved stitches have to move from the front of the work to the back midway through the cable. But that only happens on two rows in the twenty row repeat. For the other rows, I’m cable free. 3-All I want for Christmas is more hours in the day to knit!